Even though we’ve had our little differences in the past Hal, I want you to know I have always held great admiration for you and have many fond memories of our association. I was deeply shocked to hear about the Studio situation & felt I would like to express my sincere regrets. Its difficult to realise that such a thing could happen to you - I am terribly sorry Hal, but I know you have great fortitude & courage, & will come through 'Flying Colors! Even tho' we've had our little differences in the past Hal, I want you to know I have always held great admiration for you & have many fond memories of our association. You have many friends Hal, so I am not alone in wishing you well & lots of good luck in your hour of misfortune, if anything I can do, please do'nt hesitate. My kindest regards and every good wish. I really wasn’t very interested as to who won the Oscars. Not having seen these recent films I wouldn’t know who was deserving the honor or not. Thanks your nice letter with enclosure of Postal rates books, I was pleased to get them & appreciate your kindness & trouble - thanks to Bob too. I was delighted to note in the book that the International & Domestic Manual can be purchased at the Post Office, so will be able to purchase one in Santa Monica. Its the Foreign service information I required mostly. Sometimes & quite often I can't decipher the names of Towns Abroad due to the strange hand writing, so I generally have to take the letter to the P.O. & they are able to help me by checking through the Foreign manual, so have always had the desire to obtain one. Can Imagine you had a hectic week with the Family re-union, am sure you had a wonderful time getting together. The weather here too is lovely, seems like we've had no winter at all - having had no rain for so long am afraid its going to be bad for the Fire situation with the Timber & Brush being so dried up. Its a serious hazard. Yes, we saw the Academy Award show - frankly, was very disappointed, I felt it was too long & dragged out, it was'nt necessary to make a Variety show out of it - after all, the main purpose was to see who won the Oscars, not a lot of legitimate people trying to be funny - like David Niven throwing his coat on the floor etc. very undignified I thought. One hour would have been ample time for an affair like this. I thought Liz Taylor looked very bad, she did'nt seem to have her usual glamour - I guess the recent scandal put her in a bad light - I was really surprised she appeared at all. I really was'nt very interested as to who won the Oscars, not having seen these recent films I would'nt know who was deserving the honor or not - everybody seamed to be happy to see Susan Hayward elected, so I guess she was worthy. Thanks for the S.F. Chronicle news photo of L&H. Some friends of ours just arrived from Australia & are spending a week here before returning to England, a Mr & Mrs Jack [& Nora] Hogg. He & I went to the same school together in 1900 & have corresponded for many many years since - a long friendship is'nt it? It was sure wonderful to see him again & to refresh happy memories - we are about the some age (69). Well, all for now & thanks again for your kindness in sending me the P.O. information. My kindest regards & best to you all. I visited Havana once, enjoyed it very much. It’s a very interesting place. I was sailing from New York to Los Angeles and stayed over in Cuba for about 12 hours, so was only a short visit. Am happy to know you have the hospital situation straightened out, its much better than going back & forth every day, & will save you lots of unnecessary transportation, that would have been very difficult & I know it would have been pretty rough on you Jack. You are very sensible to take a private room, its worth the few Dollars extra to avoid being disturbed by another person's whims or wishes. I think this therapy will do you a lot of good Jack & will help you a lot, at least it should be encouraging to you & give you some incentive. I sincerely hope you will make lots of improvement, I feel sure it will prove beneficial. I do'nt worry too much about my diabetic condition, have learned to live with it after ten years. I do'nt stick strictly to diet - do'nt make myself a martyr to it - life's too short. I have a highball occasionally & eat a little of what appeals to me whether I'm supposed to have it or not - it has'nt bothered me so far. Lincoln must have had a wonderful time in Cuba, I visited Havana once, enjoyed it very much, its a very interesting place. I was sailing from New York to Los Angeles & we stayed over in Cuba for about 12 hours, so was only a short visit. Sorry to note the weather has turned bad again - we are so fortunate here in California, its really a wonderful climate to live in. Goldie sounds like Eda, she hates to cook too, its lucky I'm not too particular in my food business. Marilyn Broat called me the other day, we had a nice chat. Enjoyed talking with her, she sounded to be a very nice Girl. She asked after you both & sends her love - said she would call me again sometime. Don't forget to let me know the address of the hospital, so I can drop you a line Jack - I know mail is always welcome when you are alone. Hope you will be provided a TV in your room, it takes your mind off things during the long hours - most hospitals here have one in each room. If you are interested in Boxing bouts there's two or three Title fights coming up soon which will be very exciting Heavy-weight, Light heavy & Light-weight. I'm quite a fan of this sport, never miss seeing them, they really thrill me, especially when they are for the Championship Title. I guess you do miss your Social Activities Jennie, but I know you are happy to sacrifice anything for your devotion to Jack, & am sure nothing else matters, & know he would do the same for you. We have some friends visiting here from England, we went to school together in 1900 & have corresponded for many years, we are having a wonderful time reminiscing our early days, you can imagine we have plenty to talk about. They left England last September & toured South Africa & Australia, they leave next week for a trip to Canada & will sail home in May from Montreal. He was a Concert pianist & entertainer but now retired, they have a lovely home near Newcastle-On-Tyne, Eng. but they love to travel to various Countries, so they really enjoy life. Think thats all for now, so Eda joins in love & best to you both. I went to Bell High School more than fifty-five years ago. I took several classes, but the one that made me feel at home was the Junior Drama class I took from Ray Phillips. I appeared, as I recall, in seven or eight plays he directed, always in character roles. I played Oliver Hardy, of the comedy team of Laurel and Hardy, in two of those plays. My friend Bryan Walker played Laurel. 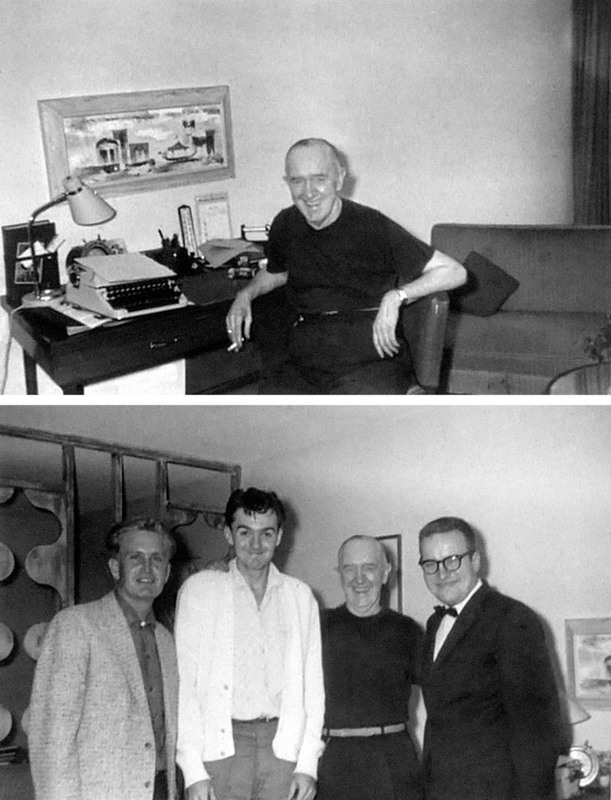 To prepare for these parts, Bryan and I visited Stan Laurel at his apartment in Santa Monica. I am in the extreme left of the second photo and my My friend Bryan Walker is to Stan’s right in this photo taken in the spring of 1959. Many thanks for the copy of the "Shields Evening News" (March 21st.issue) - appreciated your kind thoughtfulness, it was very sweet of you. I get this paper sent to me occasionally & enjoy reading the current events & of course a lot of happy memories come to mind. I was interested in reading the reference to the Wine cellars in Dockwray Square houses, I remember ours so well, & my Dad having several theatres around the Tyneside naturally had Bar Licenses, so a great deal of Liquor & Wines were stored in the cellar at home - generally full to the ceiling. I never ever thought that those same walls would someday become grave stones. Strange that I should hear from you at this time, a Mr & Mrs Jack Hogg are here visiting me for a week, they are from North Shields & live in Stocksfield. I've known Jack since 1910, we went to school together in Tynemouth & have correspond all through these many years - his wife comes from Cullercoats. You can imagine the wonderful time we are having remeniscing our old days, they have been on a trip to South Africa & Australia, they are leaving from here next Friday for a tour through Canada & will sail home from Montreal in May sometime. I certainly am enjoying seeing them again. Another Lady visited me last week, a Mrs Arthur Miller, she lives in Tynemouth (Percy Gardens). Looks like I'm having a 'Geordie' re-union does'nt it?.! Think thats about all for now. Thanks again for your kind remembrance. My regards & best always. I declare under the penalties of perjury that this return (including any accompanying schedules and statements) has been examined by me and to the best of my knowledge and belief is a true, correct, and complete return. Please to know you finally got Jack into the hospital. I wouldn't want to make any suggestions in regard to the removal of catheter or medication - the urologist will take care of that - I can imagine it is lonesome for you being alone in the house. Glad you had a nice time at the French restaurant, no wonder you got cramps mixing wine with Hollywood beer, that's an awful mixture. You sure do manage to get caught in other peoples troubles & taken advantage of. You're too kind hearted Betty & let them walk all over you - just because you are a relative does'nt give them the privilege to impose on you like that - they sure had a lot of nerve to cancel the regular help around there & put all the responsibility on your shoulders, especially when they can well	afford it. Anyway, its nice to know your Aunt made such a wonderful recovery. I hope at least she is grateful for all you did for her & will in someway show her appreciation. That was awful, Wayne having to travel so far every day, this really disrupted your home life - am sure you'll be happy to get back again & get things in order & get a good rest. Note Wayne is working in Barstow - is it too far for him to stay home or will he have to live near his work?. You certainly must have had a hectic time in Bakersfield to lose 15 lbs. it would have been easier for you to have gone to 'Vic Tanney's. Do'nt blame you for feeling sore at the whole thing, hope by now you have settled down & gotten over it. Everything here as usual Betty so not much to tell you. Eda joins in love & best to you both. Take care of yourself. By now & God Bless. Vic Tanny was the most visionary entrepreneur in the health-club field. He opened his first club in 1935, a year before Jack LaLanne opened his. In 1940, Tanny opened a gym in Santa Monica, California; he also opened one in Long Beach. After the war ended, he moved his Santa Monica operation into a former USO facility. The 7,000-square-foot gym, known as The Dungeon, became the hub of the Muscle Beach crowd, and just about every famous musclehead who passed through Southern California in the late 1940s. ‘Chumps at Oxford’ was made in the studio. The Oxford background was done in ‘process’ shots. Pleased to know Mademoiselle Kathy is coming along OK & you are all getting organized - you are sure in a tough spot now Earl with three Ladies on your hands, they will have the majority rule over you!. You'll have to have a couple of Sons now to protect yourself. I am feeling pretty good Earl, about as well as I'll ever be I guess - am getting kind of used to my situation, I just have to learn to live with it & accept it as such. Thank God I was fortunate not to be bed-ridden for the rest of my days. My house that is rented is not in Malibu - its in Santa Monica, about 30 blocks from here. We pass by once in a while & the new tenants seem to be taking good care of it. No Mrs L does'nt miss the garden, she's glad we are relieved of that worry & care of attending to it, we have a gardener to look after it now twice a month, he keeps the lawns in shape & necessary trimming of bushes etc. Funny you mentioned "Chumps at Oxford" film - I had a letter from Walter Eccles last week & he asked me the same question in regard to the Maze scene, he too had just seen it. The entire film was made in the Studio, the Oxford background was done with 'Proscess' shots - its quite complicated, so its difficult to explain to you that method. I understand now that Lou Costello did leave some estate for his family-about $200,000. but still thats not a great deal considering he had earned several Million - anyway am glad at least they have some protection. Walter told me he had given up the 'Trailer' idea & had decided to finish building the house he had already started Instead. He has also invested in a house & lot which he will rent, this income will pay off the balance. I think he is very wise to invest in land, as Arizona property will become very valuable in the near future, its growing fast & fortunes will be made - like California. Buying & selling property can be extremely profitable out here, due to the wonderful climate. Unfortunately I did'nt have the foresight to invest in real-estate, I could have been sitting on 'Easy Street' now, I was sure stupid. I met Don Ameche on several occasions but never his Brother Jim. Frankly, I did'nt know he had a Brother - thats how little I knew of him. The book is now finished, & hope to have in the hands of a publisher soon, I imagine there is a lot of work to be done on this end of the project before its finally ready for the Market - lots of photos, cover design & necessary revisons by the Editor etc. I am not familiar with this procedure, so have no idea the time it will take. I imagine they have to figure out the kind of paper to be used, type setting to be done, proofs checked thoroughly, & probably many other details connected with it which I know nothing about. I shall be glad when its all overwith, its been a long drawn out affair. It was started in '54. Hope by now prospects look good for getting rid of your business & you will soon be Heading West. Mrs L. joins in every good wish to you all. Take care of yourself. Good luck & God Bless. P.S. Walter asked me to send you the enclosed news articles. Thought they would interest you. In the early 1950s, the Internal Revenue Service charged Lou Costello and his partner Bud Abbott for back taxes, forcing them to sell their homes and most of their assets, including the rights to most of their films. Mrs L. was worn out washing dishes etc. & driving them back & forth to their hotel every night at 11-30 PM. You can understand our relief when it was over with. However, all in all we had a nice time. We too had some rain, but its bright & Sunny again, I doubt if we had enough to do any good, they were only slight showers. Note you intend covering your Patio, the color plastic roofs are very popular down here - many people are discarding the canvass covering in favor of plastic type, they are easier to keep clean & never wear out & I understand more inexpensive. My old barbeque roof was covered with colored glass, but this plastic is just as effective & much safer & lighter, it gives it a very pleasant atmosphere being a sub-dued light, each strip was a different shade. Our patio on Franklin Street is located the same as yours, only shady in the afternoon. It was very sweet of your Mother to cut out the news picture - please convey my thanks for her kind thought. Did you see 'Playhouse 90' last Thursday (April 23rd.)? The young Lady that appeared in it came from England to do this show, her name is Heather Sears - she came to visit me last Tuesday, her father is a famous surgeon at one of the leading London hospitals & he asked her to try & get a picture taken of herself with me as he was a great Fan of L&H, so she arrived with a press photographer & made one or two for him. She was very charming (23 years old), she returns to England next week. I certainly enjoyed meeting her. Unfortunately I missed the show as we were playing cards that night. Would have very much liked to have seen her work. Am enclosing you a review of the show & they speak very highly of her. She told me she had several offers to make films over here & may come back again shortly after she gets through with her English studio commitments. Enclosed are a few more stamps for Bob, hope they'll be of interest to him. Well, think thats about all for now. Mrs L. joins in regards & best to you all. Heather Sears (1935-1994) made her stage debut in 1955. She was most active in films in the years 1960-62, appearing in Room at the Top, Sons and Lovers, and Phantom of the Opera (as Christine). Sears also acted on television, and on April 23, 1959, she appeared in a live broadcast of A Corner of the Garden on Playhouse 90. 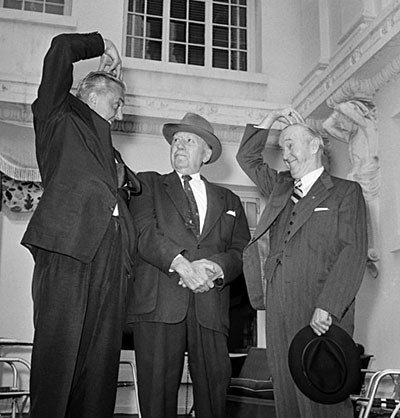 The big international news this week is the summit conference of the Big Three of comedy—France’s Jacques Tati, England’s Stan Laurel and America’s Mack Sennett. “Their decision: the world needs more pantomime comedy. “The meeting came about because of a remark by Tati in an interview months ago. He said that if he ever went to Hollywood, he would like to meet and pay homage to Laurel and Sennett. When the French comedy maker came here to get an Oscar for My Uncle as the best foreign language film, I arranged the meeting. “It took place on the porch of the Garden Court Apartments, a block from Grauman’s Chinese on Hollywood Boulevard. Sennett, who is recovering from a gallstone operation, has lived there for years. Stan, the thin, surviving member of the great Laurel and Hardy team, came in from his seaside home. “Sennett and Laurel, both modest men, accepted the thanks humbly. Mack complimented Tati on his films and said he compared favorably to Charlie Chaplin, whom Sennett discovered. Laurel apologized for not having seen them because of ill health. “There was much laughter at the meeting: Hollywood boulevard rang with Laurel's great cackle, Sennett’s booming guffaw and Tati’s Gallic giggling. “They discussed their volume of work. Perfectionist Tati had made but four films, Laurel “a couple of hundred,” Sennett 1,000—“but I started early!” They talked and laughed for almost an hour, then parted, the two older men returning to retirement and Tati going back to France to continue his work for the pantomime art.